Porch Gallery Ojai presents When Ice Burns: Selected Works by Diane Best. Best has long been drawn to the expansive emptiness and harsh landscapes of the Southwest desert. She experienced that same sense of discovery and wonder for place while traveling to Iceland and the remote fjords of Greenland. Through drawings, photos, and films the works in When Ice Burns reflect the commonality of vastness, starkness, and space in the dramatic desert and frozen landscapes. Utilizing contemporary theories of photography, cinema and digital imaging, Best updates the tradition of the 19th Century American Conservationist artists. She focuses not just on the severe terrains of the places she documents but also on the people and cultures that inhabit those regions. 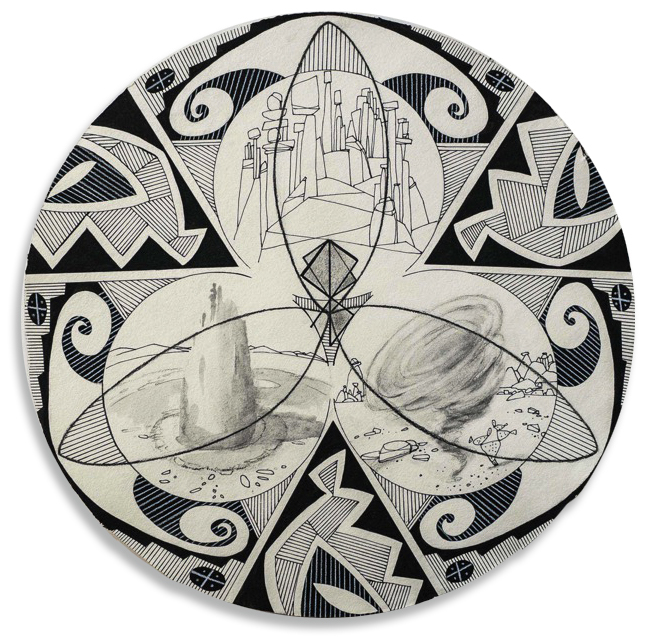 Her Mandala-like drawings incorporate images of Viking runes and pueblo pottery designs with landscape elements of Iceland, and the desert Southwest. Her photographs and film round out the series highlighting the immense beauty and isolation of the areas. Diane Best was born in Boston, Massachusetts, and studied in the San Francisco area (Stanford University, San Francisco Art Institute). Upon moving to Southern California she began capturing the intense drama of the desert landscape that surrounded her. Now living in Joshua Tree, California, Diane has focused her talent exclusively on documenting the dramatic imagery of various desert landscapes. Best’s work has been presented in solo and group exhibitions throughout the country, including The Carnegie Museum, the Southwest Museum in Los Angeles, and the BoxoProjects in New York.